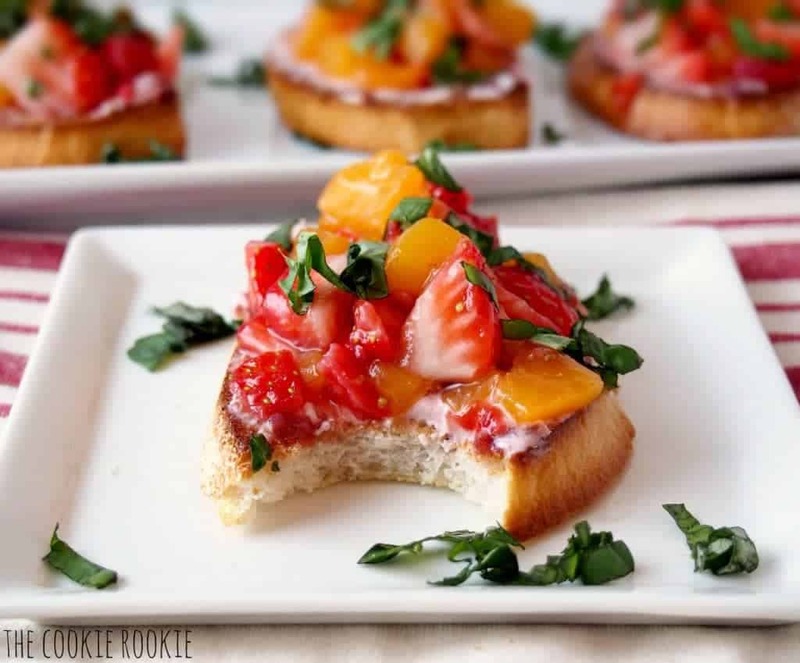 SUMMER FRUIT BRUSCHETTA is the perfect beautiful appetizer for any party or BBQ. Just so delicious! After our harsh and bitter winter, I am so very ready for summer. I’m ready for the pool, sunlight (I’m incredibly tired of being nearly transparent from the lack of sunlight), and barbecues. 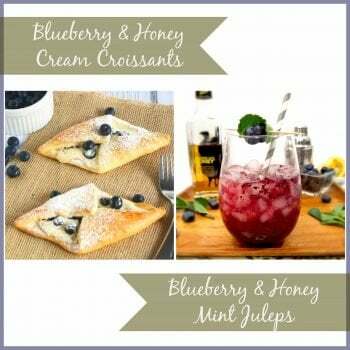 Just because so many Spring and Summer get-togethers are outside barbecues doesn’t mean you can’t bring something beautiful and elegant to the party! I especially love food that is beautiful and elegant while still being incredibly simple. This Summer Fruit Bruschetta will brighten any table and is sure to be an easy party favorite. One of my favorite new items in my pantry is raspberry white balsamic vinegar. Yum! 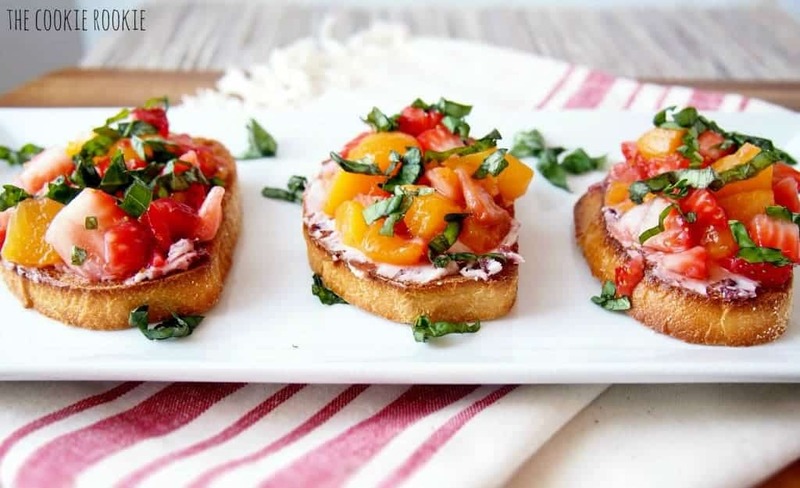 It’s delicate and delicious, and is the perfect topping to this bruschetta. I can’t wait to try it on salads and all sorts of other meals. 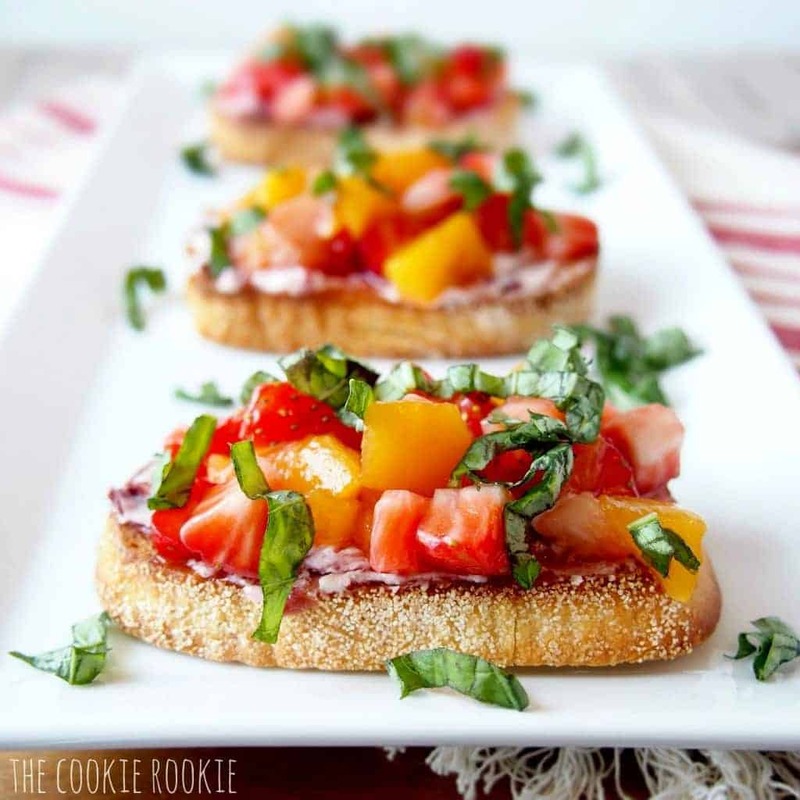 But first, I’m going to keep drizzling it on this fruit bruschetta and welcoming the summer months with open arms! 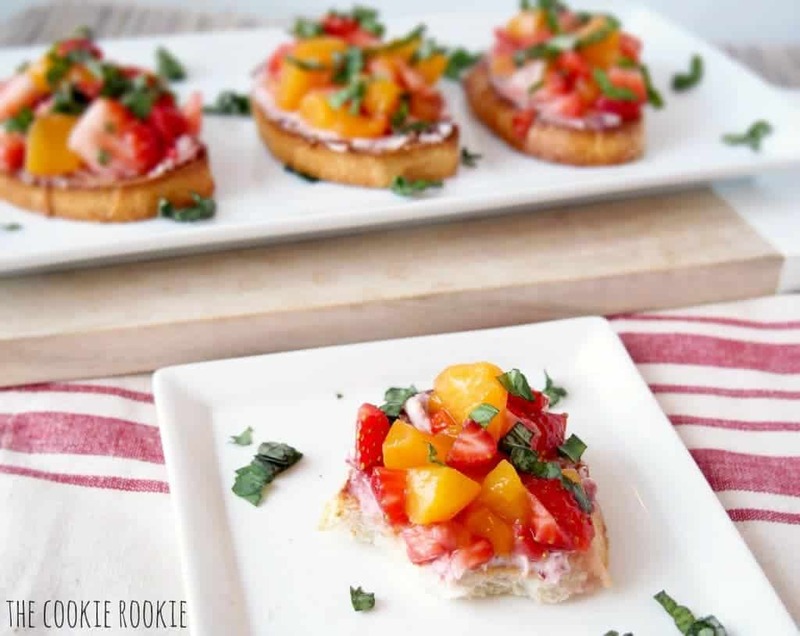 This sweet summer treat is the perfect appetizer or dessert! 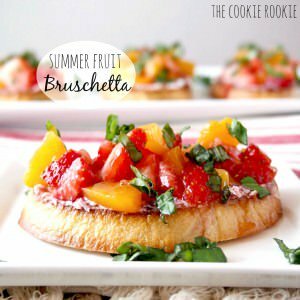 Summer Fruit Bruschetta is quick, easy, fresh, and delicious! 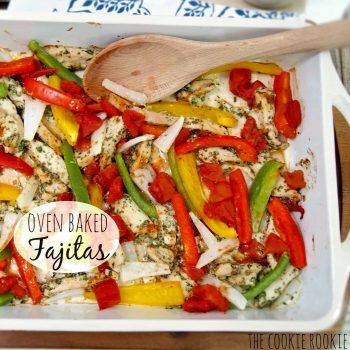 Preheat oven to 350F. Place French bread on a baking sheet and bake for 8-10 minutes until fully toasted. 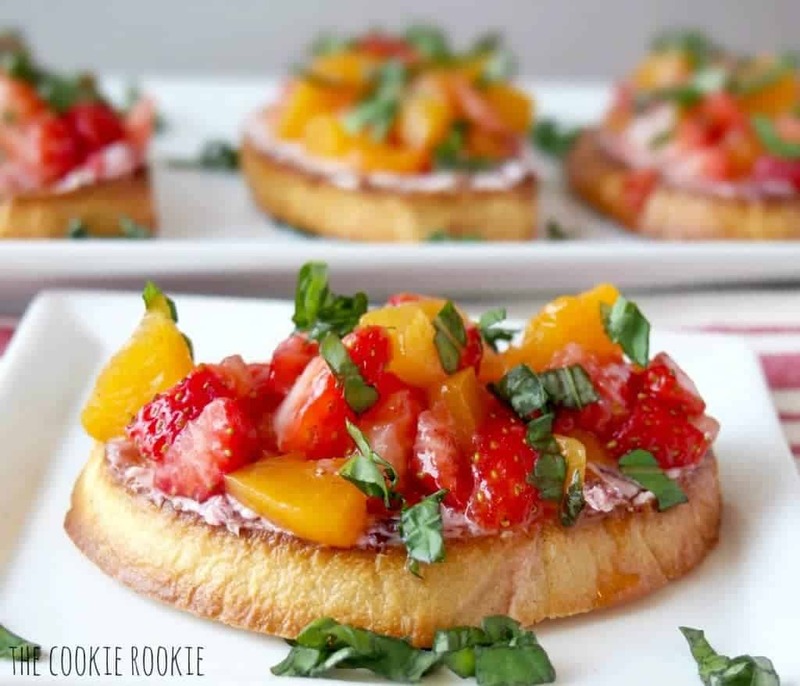 In a medium sized bowl, combine strawberries, peaches, and balsamic. Spread Cranberry Goat cheese onto each slice of French bread. This looks so fresh! Can’t wait to make it. Thanks for sharing..
Now THIS is what summer is about! Looks absolutely delicious!!! It must be delicious. 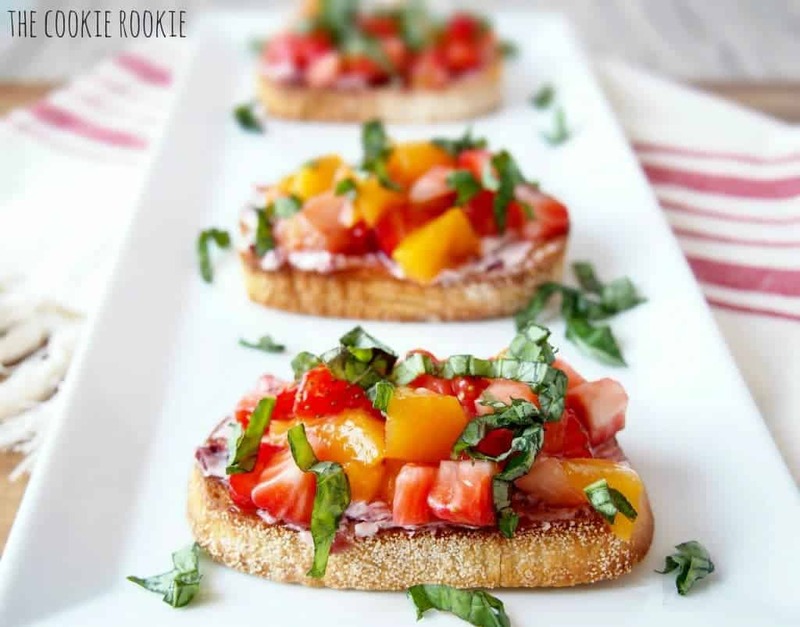 I’ve had the seasonal veggies bruschetta but not fruit. Looks good too. Wow not only does this look so delicious, it’s sooo pretty!! Raspberry White Balsamic Vinegar….what?!? I’m gonna have to get my little hands on that soon! 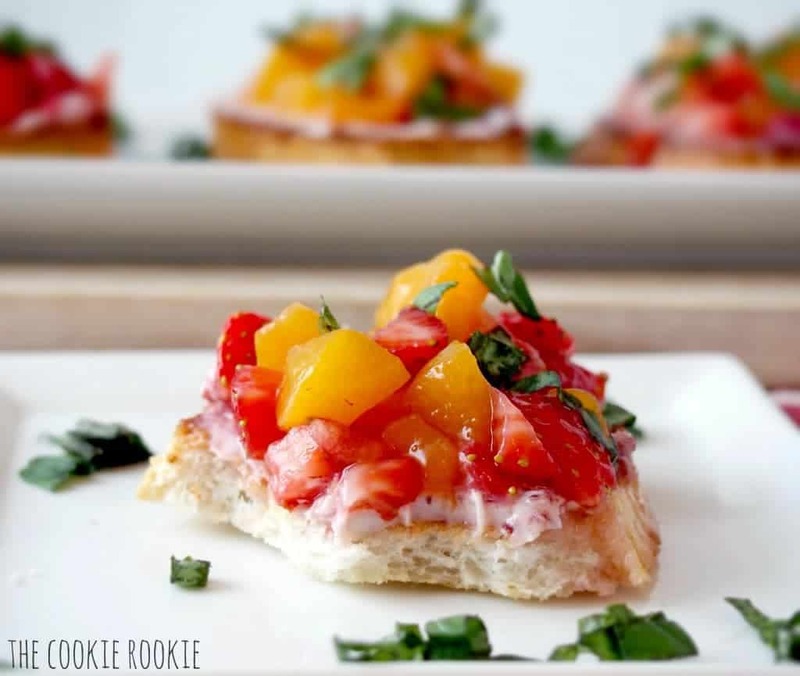 And this bruschetta….you know I am a sucker for anything with the title bruschetta!!! Love this! I am so ready for summer to and all the delicious food that goes with it! Pinning for later! These look and sound absolutely perfect for summer. I want summer to come right now, and I want some of these right now too! Yummy! G’day! Very healthy indeed! GREAT photos! I love flavored vinegar. I have a coconut white balsamic I found recently it’s incredible what the extra flavor does to a dish.